Use 1 inch margins on all sides. On the first page, put the page number at the bottom center. For all following pages, use the top right corner. For a full set of instructions and examples, see the SBL Handbook Student Supplement. Bible, religion, or philosophy sometimes use the SBL (Society of Biblical Literature) style of citations. Similar to Chicago/Turabian, you can use the examples on the right to model your citations. However, the final authority for the bibliographic form used in your paper is your professor. You can also use the Student Supplement to the SBL for a simplified set of instructions. 12. Bernard M. Levinson, ed. Deuteronomy in The New Oxford Annotated Bible (ed. Michael D. Coogen; Oxford: Oxford University Press, 2001), 253. According to Bernard M. Levinson, "...quotation..." (2001, 301). Levinson, Bernard M., ed. Deuteronomy. Pages 240-308 in The New Oxford Annotated Bible. Edited by Michael D. Coogen. 4. Raymond Brown, The Gospel According to John XII-XXI, Anchor Bible 29A (Garden City: Doubleday, 1966), 980. 32. Brown, The Gospel According to John XII-XXI. 1159. According to Raymond Brown, “...quotation...” (1966, 1159). Brown, Raymond. The Gospel According to John. 2 vols. Anchor Bible 29A.Garden City: Doubleday,1966. 33. Krister. Stendahl, “Biblical Theology, Contemporary,” IDB 1:418-32. 39. Stendahl, “Biblical Theology” 1:419. According to K. Stendahl, “...quotation...” (1962, 1:422). Stendahl, Krister. “Biblical Theology, Contemporary.” IDB 1:418-32. 24. Marcus Joel, “Rivers of Living Water from Jesus’ Belly (John 7:38),” Journal of Biblical Literature 117 (1998): 329. 35. Joel, “Rivers of Living Water,” 330. According to Marcus Joel, “...quotation...” (1998, 330). Joel, Marcus. “Rivers of Living Water from Jesus’ Belly (John 7:38).” Journal of Biblical Literature 117 (1998): 328-330. 12. Martin Hengel, The Johannine Question (London: SCM; Philadelphia: Trinity Press, 1989), 132. 19. Hengel, The Johannine Question, 152. According to Martin Hengel, “...quotation...” (1989, 152). Hengel, Martin. The Johannine Question. London: SCM; Philadelphia: Trinity Press, 1989. Electronic Book - When citing an online version of a book, include the DOI instead of the book format. If the DOI is not available, include the URL in the citation. 14. Jo-Ann A. Brant, Ancient Fiction the Matrix of Early Christian and Jewish Narrative. (Atlanta: Society of Biblical Literature, 2005), E-book edition, 129. 18. Brant, Ancient Fiction, 132. Brant, Jo-Ann A. Ancient Fiction the Matrix of Early Christian and Jewish Narrative.Atlanta: Society of Biblical Literature, 2005. E-book edition. 43. Carl P. E. Springer, "Of Roosters and Repetitio: Ambrose's Aeterne rerum conditor," VC 68 (2014): 155-77, doi:10.1163/15700720-12341158. 45. Springer, "Of Roosters and Repetitio," 158. Springer, Carl P.E. "Of Roosters and Repetitio: Ambrose's Aeterne rerum conditor." VC 68 (2014): 155-77. doi:10.1163/15700720-12341158. Mark 7:11-21 means chapter 7 verses 11 through 21. Mark 7:11-21:1 means chapter 7, verse 11 through to chapter 21, verse 1. Mark 7-10 means chapters 7 through 1. Mark 7, 8 and 10 means chapter 7, chapter 8 and chapter 10. Mark 7:11, 21 means chapter 7 verses 11 and 21. Mark 7:11; 21 means chapter 7 verse 11 and chapter 21. If you are citing a modern version of the Bible, you do not need to include publisher's information. Instead, use the standard abbreviations for the Bible version (see below). If you are only citing one version of the Bible throughout your paper, only include the version in the first citation. If you are citing multiple versions, include it in every citation. 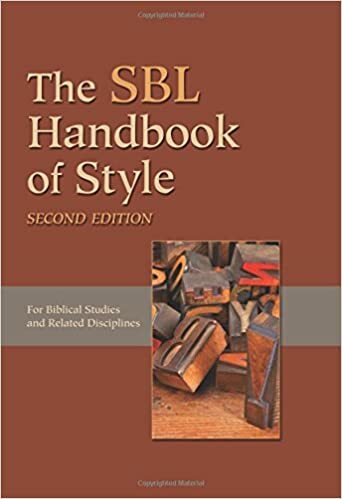 For a full list of modern Bible abbreviations, see the SBL handbook in the Reference room, or ask a librarian for help.